POWERS motorcycle is over 30 years in Yokohama. 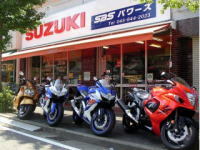 Please contact us for anything about motorcycle. These models are Japan domestic version. "( )" is the price including the consumption tax 8%. 1 year theft insurance free! You can extend to 2 years by 2,000 jpy. copyright©2018 POWERS motorcycle all rights reserved.